Map of Ukraine with Kremenchuk highlighted within Poltava Oblast. The Dnieper River in Kremenchuk, Ukraine. Kremenchuk (Ukrainian: Кременчу́к, Kremenčuk, Ukrainian pronunciation: [krɛmenˈtʃuk]) or Kremenchug (Russian: Кременчу́г, Russian pronunciation: [krʲɪmʲɪnʲˈtɕuk], translit. Kremenchug), an important industrial city in central Ukraine, stands on the banks of the Dnieper River. Kremenchuk is the administrative center of the Kremenchuk Raion (district) in Poltava Oblast (province). Kremenchuk is administratively incorporated as a city of oblast significance administered by its own city council and does not belong to the raion. Population: 223,805 (2015 est.) Along with its city-satellites Svitlovodsk and Horishni Plavni, it creates an important urban agglomeration and transportation hub. Although not as big as some other oblast centers and cities of regional significance, Kremenchuk carries importance of a large industrial center in Ukraine and Eastern Europe as the base of the KrAZ truck plant, Kremenchuk Oil Refinery of Ukrtatnafta, the Kryukiv Railway Car Building Works, and nearly located (Svitlovodsk) Kremenchuk HES. Over the dam of the hydro-electric power plant stretches one of river crossing over Dnieper (Highway M22). Originally established on the left bank, Kremenchuk eventually incorporated a city of Kryukiv on the right bank. The Kryukiv Railway Car Building Works is one of the oldest railway repair and rail-car building factories in Eastern Europe, dates back to 1869. Kremenchuk was supposedly founded in 1571. The name Kremenchuk is explained as deriving from the word "kremen" - flint (a mineral) because the city is located on a giant chert plate. An alternative explanation says that "Kremenchuk" is the Turkish for "small fortress". In 1625, at Lake Kurukove in Kremenchuk, the Treaty of Kurukove was signed between the Cossacks and the Poles. Since the establishment of Cossack Hetmanate, the city was part of the Chyhyryn Polk (regiment). Following the Russo-Polish War (1654–1667) and Treaty of Andrusovo, the city was secured by Tsardom of Russia and became part of the Myrhorod Polk (regiment) within the left-bank Cossack Hetmanate. 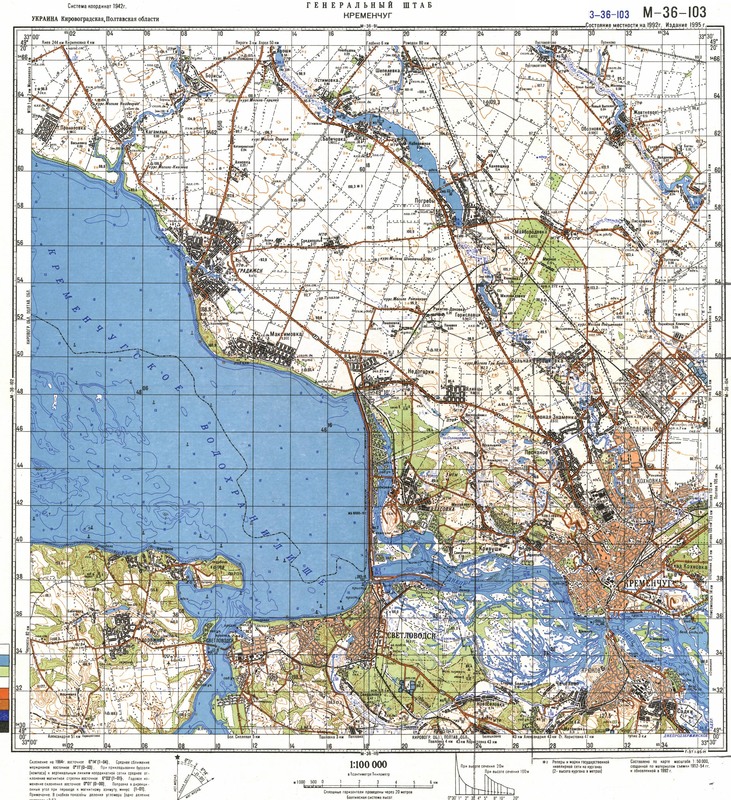 The city played a key role of the Russian colonization policy of Ukraine and their strive for the shores of Black Seas as regional administrative center of the early Novorossiya Governorate and Yekaterinoslav Vice-regency (Namestnichestvo). With creation of Novorossiya Governorate, in Kremenchuk was created Dnieper Pikers Regiment and coincidentally few years later (1768–69) in the neighboring regions of Poland started out so called Koliyivshchyna (literally the Piker's unrest). Here in 1786 started his military career the Russian general Alexander Suvorov when he was appointed a commander the local garrison (in preparation of the 1787–1792 Russo-Turkish War). Following the loss in the Crimean War, in Russia started intensively to be installed a network of railroads and in 1869 in Kryukiv were built small railcar repair shops, while in 1872 the city of Kryukiv was connected with Kremenchuk by a railroad bridge over Dnieper. In 1870 in Kremenchuk was built a factory in production and maintenance of agrarian equipment and iron cast products. In 1899 in Kremenchuk was introduced a network of tramway transportation that existed until the complete establishment of Soviet regime in Ukraine in 1921. During the Russian February Revolution of 1917 the power in city was controlled by a council (soviet) of workers' deputies which was dominated by the Russian Social Democratic Labour Party and the head of the city council became a future Ukrainian Communist leader Yuriy Lapchynskyi. During the Ukrainian–Soviet War, on 26 January 1918 the Russian Bolshevik troops secured the city, however already in February of the same year they had to withdraw due to the treaty of Brest-Litovsk and advance of German and Ukrainian armies. Following the World War I hostilities between the Bolshevik Russia and Ukraine renewed and on 1 February 1919 the Russian Red Army once again secured the city. However, in May of the same year Kremechuk was engulfed in the insurgency of Otaman Grigoriev who earlier sided with Bolsheviks and drove the international force of Triple Entante from Odessa. From July to December 1919 the city was occupied by the Russian "White Guard" troops of Anton Denikin. Following their withdrawal, the Denikin's troops blew up the railroad bridge. In 1920–1922, the city was an administrative center of briefly existed Kremenchuk Governorate during a peasant insurgency (Kholodnyi Yar) near Chyhyryn (just west of the city). During 1930s the Kremenchuk's industry was transformed, its Kryukiv railcar repair shops became a railcar manufacturing factory, while its factory in production of agrarian equipment changed to manufacturing road equipment. During World War II (1939-1945), Kremenchuk suffered heavily under Nazi occupation. It was occupied from September 15, 1941 to September 29, 1943. More than 90% of the city's buildings were leveled over the course of the war. 29 September, the day when the city was liberated from the Nazis in 1943, is celebrated in Kremenchuk as the City Day. Despite a remarkable post-war recovery and a healthier economy, Kremenchuk lacks much of the architectural charm and distinctly Ukrainian (rather than Russian) character of its sister city, the oblast capital of Poltava. 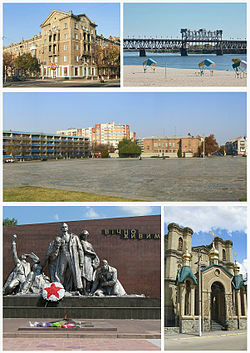 In 1975 the city of Kryukiv was merged with Kremenchuk, while Kremenchuk was divided in two raions in city. In 2014 during the mass demolition of monuments to Vladimir Lenin in Ukraine, in the city were removed two monuments of the Russian Communist leader in the city center and near the Kryukiv Railcar Factory. Oleh Babayev, the mayor of Kremenchuk was assassinated on July 26, 2014. Oleh Babayev opposed separatism and promoted national unity, prior to becoming mayor he was a member of the Batkivshchyna political party which opposed Victor Yanukovich. His political views and Kremenchuk's large industrial base may have been the motivation for the attack. During the 2014 pro-Russian unrest in Ukraine security at the Kremenchuk Reservoir was heightened as it was seen as a possible target for saboteurs. Kremenchuk's Ukrtatnafta oil refinery is the largest in Ukraine and the only one operating since the beginning of the conflict with Russia that left refineries in the Donbass inactive. Kremenchuk is the economic center of the Poltava Oblast and one of the leading industrial centers of Ukraine. It contributes about 7% (2005) of the national economy and accounts for more than 50% of the industrial output in the Poltava Oblast. The city is home to KrAZ, a truck-manufacturing company (one of the largest in Eastern Europe) as well as a major European oil refinery operated by Ukrtatnafta, the road-making machine works, Kremenchuk Automobile Assembly Plant, the railcar plant and KVBZ KrVZ (Kryukovsky Wagon Plant) train railway rolling stock wagons , the wheel plant, the carbon black plant, the steel works and others. The light industries of the city include tobacco (JTI), confectionery (Roshen), a knitting factory as well as milk and meat processing plants. Kremenchuk is one of the most important railway junctions in Central Ukraine (thanks to its geographical position and a bridge over the River Dnieper) and a major river port on the main river of Ukraine. Kremenchuk is home to HK Kremenchuk ice hockey team who compete in the Ukrainian Championship and FC Kremin Kremenchuk football team. Beside FC Kremin, the city was also represented by number of other professional football clubs such as FC Adoms Kremenchuk, FC Naftokhimik Kremenchuk, and FC Vahonobudivnyk Kremenchuk. The city has several sports schools (DYuSSh), about six stadiums including Polytechnic Stadium (main city stadium), Kremin Stadium, and others, as well as couple of swimming pools and couple of athletic halls. Anton Makarenko, educator, social worker and writer. Vyacheslav Senchenko, World welterweight boxing champion. ^ "Ukrainian Zip Codes". angelfire.com. ^ "Phone Codes for Russia, Ukraine & CIS". russia-ukraine-travel.com. ^ "Чисельність наявного населення України (Actual population of Ukraine)" (PDF) (in Ukrainian). State Statistics Service of Ukraine. Retrieved 1 July 2016. ^ "Kryukov Railway Car Building Works". Kryukov Rail Car Building Works Home Page. Retrieved 2014-10-03. ^ "Early history of Kremenchug". ^ "Attacks kill Ukraine mayor Oleg Babayev, bomb Andrii Sadovyi's house". NewsComAu. ^ Подробности-ТВ. "Самооборона взялась за охрану Кременчугского водохранилища от браконьеров". podrobnosti. ^ "HK Kremenchuk". Elite Prospects. Retrieved 2016-01-01. ^ "МФК "КРЕМіНЬ"". www.fckremen.com. Retrieved 2015-11-23. ^ "Dimitri Tiomkin biography". dimitritiomkin.com. Retrieved 2012-12-29. ^ "Sister cities of Kremenchuk" (in Russian). telegraf.in.ua. Retrieved 2015-04-27. Wikimedia Commons has media related to Kremenchuk. The murder of the Jews of Kremenchuk during World War II, at Yad Vashem website. This page was last edited on 29 March 2019, at 13:02 (UTC).